Some of each to report. I cut it down with our hand-sickle. 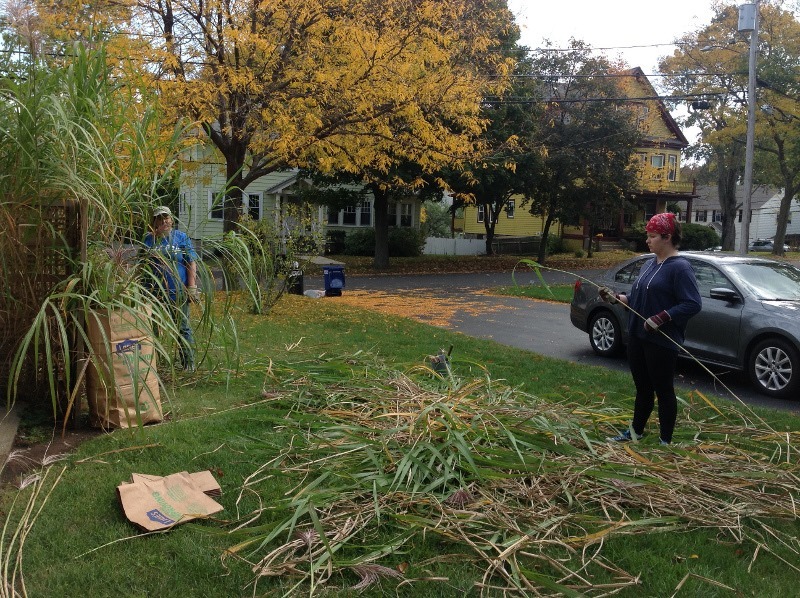 Younger Daughter is stripping leaves from the longest stalks. Elder Daughter and she bagged the remains for yard waste recycling, setting aside the best canes for use in next year’s bean trellis. Resident Male took a heavy maul and split the clumps, which after two years unsupervised, were threatening a massive campaign of lawn-conquest. So goodbye grass! Hello, next year’s beans! I like the way the mitering worked, even on the very narrow green strips. I also used a sawtooth with a ten-row repeat, so I was able to easily fit it around corners, letting the natural splits between the teeth accommodate the direction change. 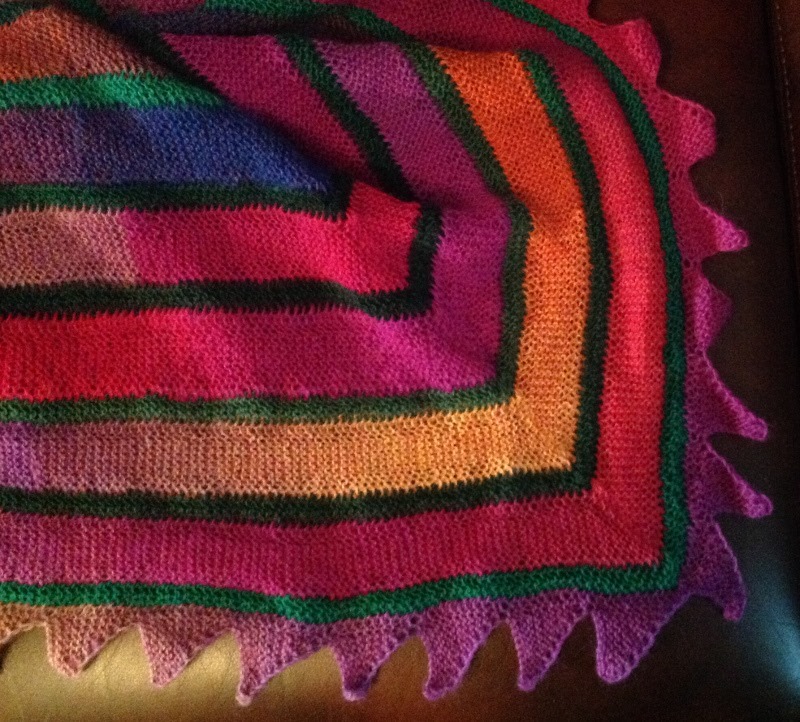 Swirly now goes to Elder Daughter, to replace the last blanket I knit for her, back when she was born. Third, I can’t just sit. Especially when I am thinking or listening. I have to have something going. 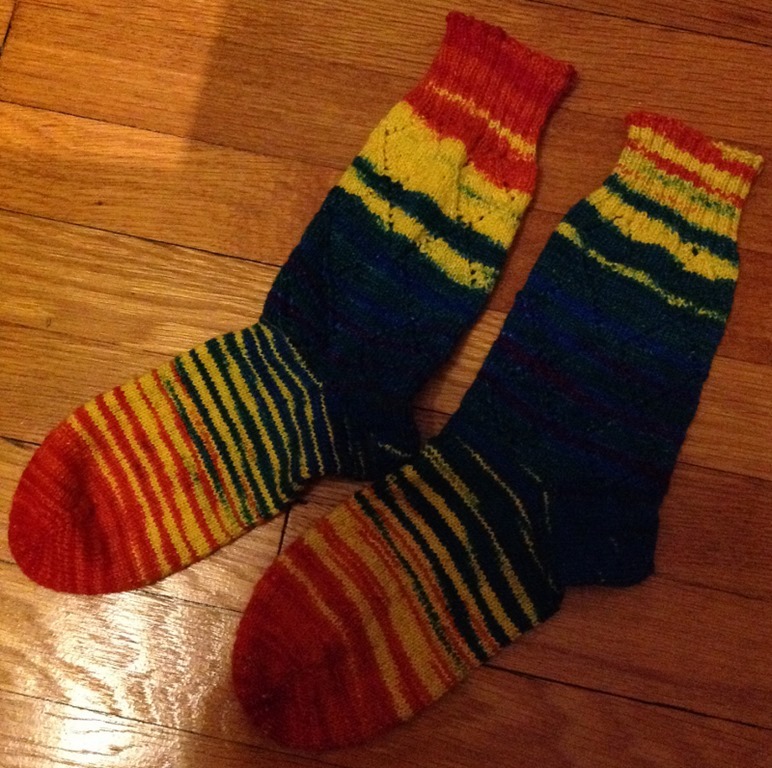 So, as a think piece, to keep my fingers occupied, and because I haven’t knit a pair of socks for me in so long my own sock drawer is looking more like a darn-me convention, I finished a quick pair for me. This was done in Plymouth Happy Choices – a yarn that comes pre-knitted into a long scarf strip, then dyed. The idea is to unravel the thing and re-knit it. Depending on what you make the resulting pattern will be different, and always a surprise. These are standard 72-stitch toe-ups on US #00 needles, with figure-8 toes and short-rowed heels. I started at the same place in the color cycle repeat for both, but you can see that slight variations in dyeing produce fraternal instead of identical twins. I happen to love it, but others may be more fastidious. And yes – there’s a simple double YO diamond detail on the ankles, just for fun. 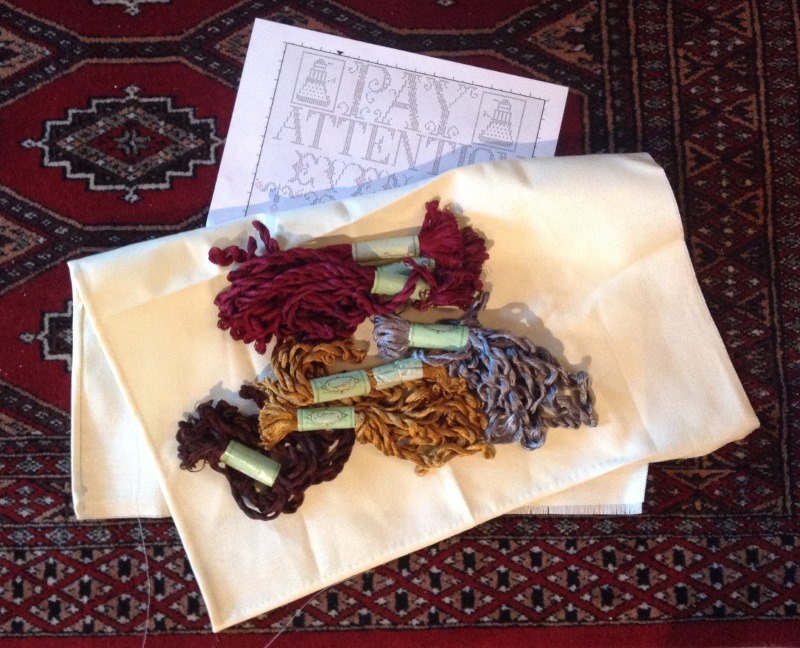 And another beginning – this time a stitching project. Younger daughter is now in 11th grade, and wants one, too. Hers will have a different motto, chosen just for her: “Pay attention even to trifles,” – one of Musashi’s nine precepts. She’s also asked that it bear at least one Dalek. In addition to Amy Schilling’s Dalek (chart at link above), I am using several alphabets from Ramzi’s collection of vintage Sajou and Alexandre leaflets, available at his Free Easy Cross and Pattern Maker website – a fantastic resource that should be better known. You’ll note that for once I’ve actually laid out the motto ahead of time, rather than trust to luck and eyeballing. This is because Younger Daughter is a creature of logic and symmetry. I accommodate her preferences with a bit more precision than I usually use. More on this project as it develops. This time I’ll try to document what goes into my rather ad-hoc pattern selection decisions, and any tech tips I can. Fall is after all, a time of endings and beginnings, and my favorite time of year. Congratulations on the finishings – also on cutting that grass. Must get my own garden under more control. Particular thanks for the link to the Dr Who fairisle pattern, now downloaded to my on-line stash (with a comment added giving the source). I look forward to seeing how you use this.